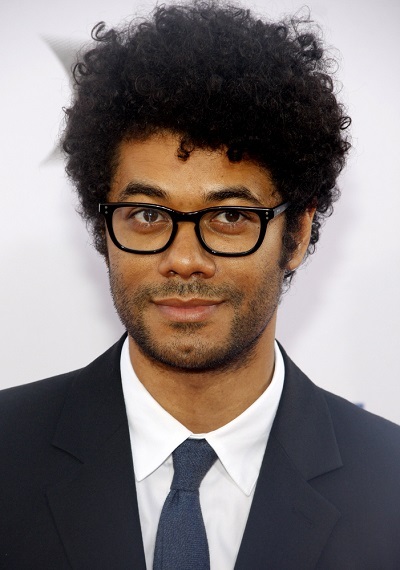 Richard Ayoade is a British comedian, actor, writer, director, and television presenter. His father is Nigerian. His mother is of Norwegian origin. His surname is pronounced eye-oh-WA-dee. Richard is married to actress and producer Lydia Fox, with whom he has three children. Lydia’s uncle is actor Edward Fox. Richard’s maternal grandfather was Ellef Larsen Bosvik (the son of Ludvig Martinius Larsen Bosvik and Marthe Amalie Aanonsdatter). Ellef was born in Søndeled, Risør, Aust-Agder, Norway. Ludvig was the son of Ellef Larssøn Bosvik and Inger Johanne Knutsdatter. Marthe was the daughter of Aanon Augensen and Anne Pedersdatter. Richard’s maternal grandmother is named Solveig Kristiansen. Am I the only one who can actually see the Scandinavian? No?